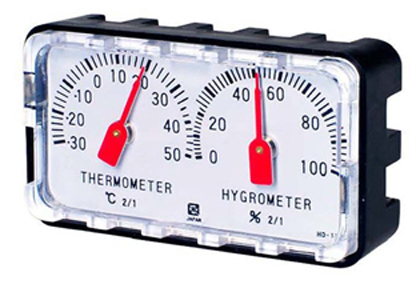 CSS Mini Mechanical Thermo-Hygrometer: The simple design, small size, reliability, and accuracy of the CSS Mini Mechanical Thermo-Hygrometer have made it popular with museums internationally. 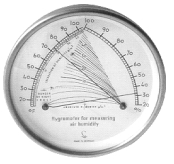 Lufft certified thermohygrometer Model 100: Lufft certified thermohygrometer Model #100 measures relative humidity, temperature, absolute humidity and dew point. 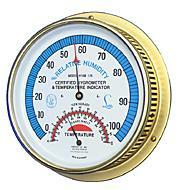 Lufft certified thermohygrometer Model 169: Lufft certified thermohygrometer Model #169 has a 6" dia. overall case of solid brass that is drilled for wall mounting. 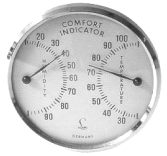 Lufft certified thermohygrometer Model 176: Lufft certified thermohygrometer Model #176 has a 6" dia. overall case of solid brass drilled for wall mounting. 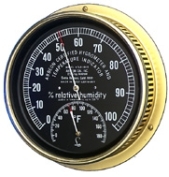 Lufft certified thermohygrometer Model 993: Lufft certified thermohygrometer Model #993 has a 3-3/4" overall brass plated case that can be wall or desk mounted.